Helping those in their community most impacted by climate change to weatherize their homes. The results were impressive– the church was able to reduce its CO2 by 7 tons per year and the weatherized homes saved energy (6 tons of CO2 reduction), and benefited from lower energy bills and more comfortable homes. As CUCC started thinking about this project they recognized that the biggest impact of a changing climate would be on the poor because they would not be able to adapt as readily as the affluent. 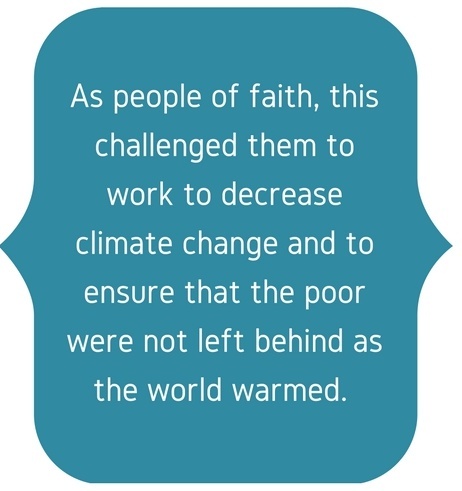 As people of faith, this challenged them to address climate change and to ensure that the poor would not be left behind. The project was led and organized by the Justice in a Changing Climate Task Force (JCC) that was formed to explore and recommend solutions to mitigate the negative effects on nature and humanity from an atmosphere overheated by excessive fossil fuel consumption. The task force invited 15 other congregations to participate in the weatherization program. To date 21 homes have been weatherized through the program by volunteers from the congregations. 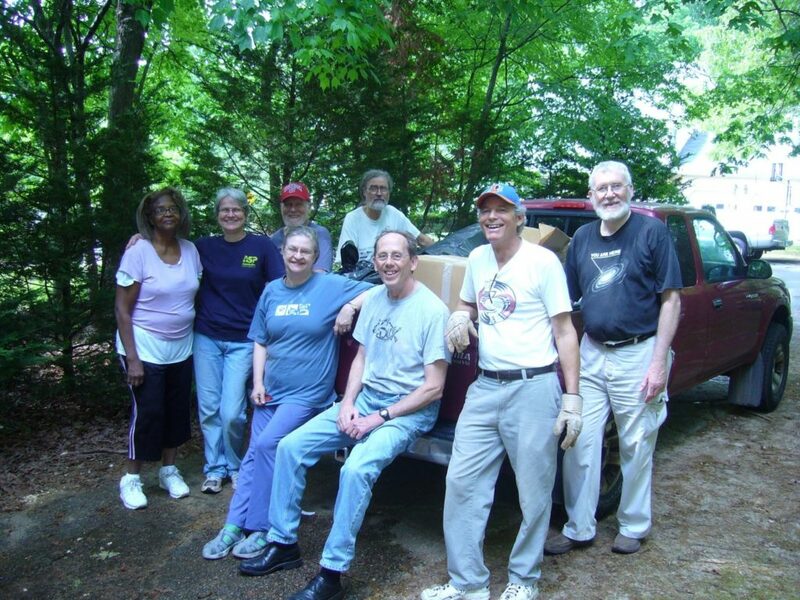 In addition to decreasing energy use and increasing home comfort, the program brings together and motivates volunteers from local congregations. In addition to helping those in need in their community, the church wanted to reduce its own carbon foot print and decided to install a solar array to generate electricity from the sun and lower electricity costs. The congregation was in favor, but stipulated that the system could not be paid for from the church’s general fund. All the money was raised from a capital campaign with gifts from both congregational members and from people outside the church. The campaign was so successful that there was enough money to install the solar array and award seed grants to four other non-profit organizations to initiate their own solar projects. CUCC’s solar array was completed and went online in November 2015 and the church’s main building now receives half of its electricity from solar panels on its roof. 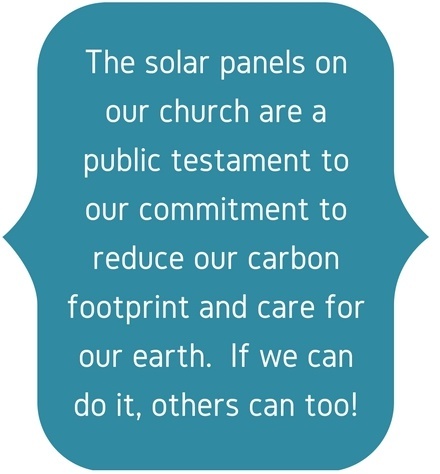 One thousand dollars a year in energy bill savings is now being directed into church missions and the church building is setting a positive example for other congregations and nonprofits inspired to initiate their own solar projects. Since its inception in 2007, the JCC, through its outstanding leadership, has inspired churches from other denominations and individuals to join the efforts to provide the poor with some relief from the real and potential devastations of climate change and championed the vision for a healthier stewardship of God’s creation. Temple Shalom’s Bright Idea Project brought together their temple members to support creating a brighter more welcome space for their congregation. And in doing so they became an energy saver leader and now save $6,400.00 per year on energy costs and have reduced their yearly carbon emissions by 48,733 lbs. Constructed over 50 years ago, their temple had yet to upgrade its lighting to better illuminate the spaces and include energy-saving technology. Hallways, worship areas, exteriors, classrooms, and storage closets seemed dingy, even forbidding. Inefficient lighting in work areas prompted several of their administrative staff to bring in desk lamps from home to help with close work. Unsurprisingly, despite its poor performance, their lighting plan cost a great deal in terms of electricity use and bulb replacement.When they discussed the need for better lighting in their synagogue, they realized that by installing energy-efficient fixtures with long-life bulbs they could create a more welcoming building while making a difference in overall temple energy use. 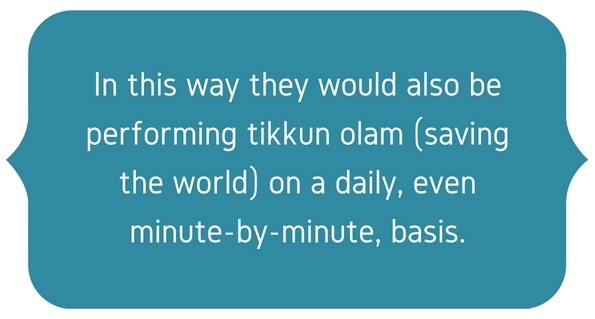 In this way they would also be performing tikkun olam (saving the world) on a daily, even minute-by-minute, basis. Their House & Grounds Committee researched what other congregations had done to improve the lighting on their campuses. 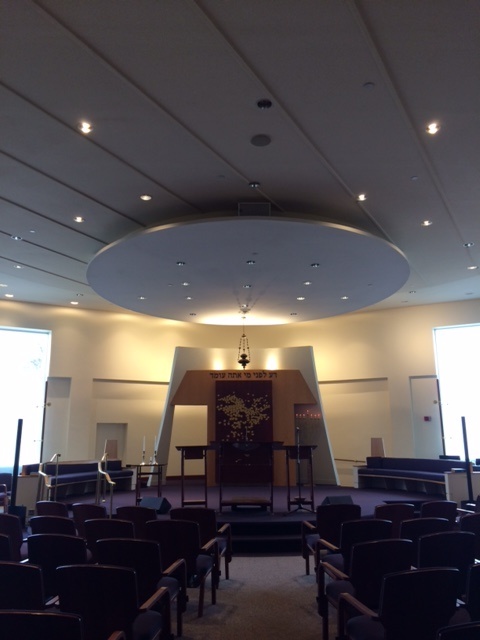 They spoke with 30 DC-area shuls and other synagogue executive directors to see what sorts of lighting fixtures worked best for them. They also researched the types of lighting needed for different spaces (ie: classrooms as opposed to worship areas) until they had a plan of how best to illuminate each temple space with the needs of the congregation in mind. Their fundraising committee rolled out its Bright Idea Fundraising Project. The committee asked Temple members to contribute $36.00 for one “light bulb,” $72.00 for two, and so forth. For each $36.00 donation, a drawing of a sparkly light bulb with the donor’s name on it went up on the lobby wall. Some members had ten or more glittering paper bulbs up there! Members and visitors really got a thrill seeing all those bright bulbs everywhere when they entered. They all felt the contagious enthusiasm for this project; seeing the bulbs encouraged people who had not yet donated (and some who already had) to provide even more funds. They heard over and over from members that they appreciated having a means by which to pursue tikkun olam at the temple. They collected total funds of $5,400 from the Bright Idea Fundraising Project, which covered about 30% of the total costs. 477 fixtures were installed in every temple space. Classrooms are now brighter by far, as are the worship areas, hallways, bathrooms, social areas and kitchen. Even the janitorial closets received new lighting, which makes even the small job of filling a bucket faster and less of a guessing game. Most notable, of course, is the amount of electricity saved. They estimate having cut usage by 20%. Genesis Chapter 1:29-30 reads: “And God said, ‘Behold, I have given you every seed bearing herb, which is upon the surface of the entire earth, and every tree that has seed bearing fruit; it will be yours for food. And to all the beasts of the earth and to all the fowl of the heavens, and to everything that moves upon the earth, in which there is a living spirit, every green herb to eat,’ and it was so.” Here He tells us that He has given us everything we need to live. It is our task to protect the earth so that it is preserved for the generations that will follow. In this way we show respect for God and for our progeny, as well as for people the world over. The congregation has completed several projects with an eye on the impact its efforts to beautify and update its campus has on the wider community. 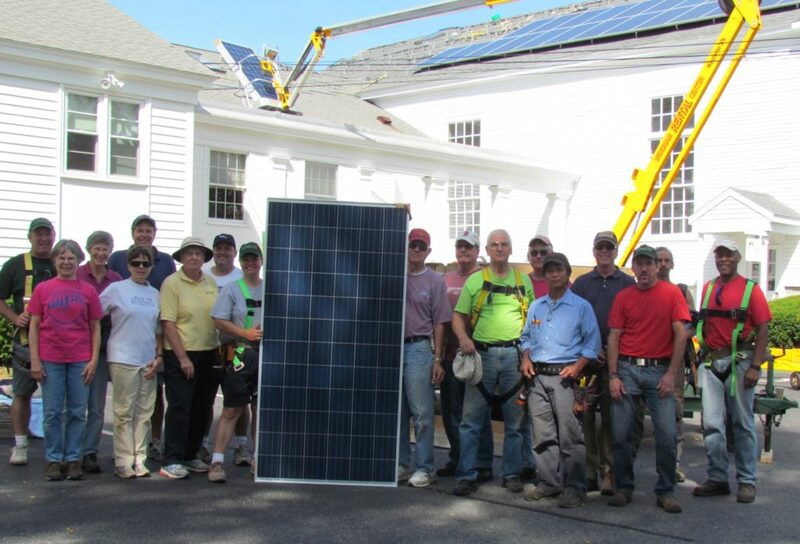 Congregational Church in Cumberland navigated a difficult political change along with creative financing to lower their carbon footprint and create momentum for community members and other local groups and governments to take their own climate reducing actions. The renewable project involved installing a vacuum-tube solar hot water heater, PV panels, and an electric vehicle recharging station. The water-heating project went almost effortlessly, as a small group of knowledgeable parishioners funded the project and oversaw the installation. Funding for the fifty-seven 305W PV panels was more complicated because it involved tax breaks and depreciation that the church wasn’t able to utilize. 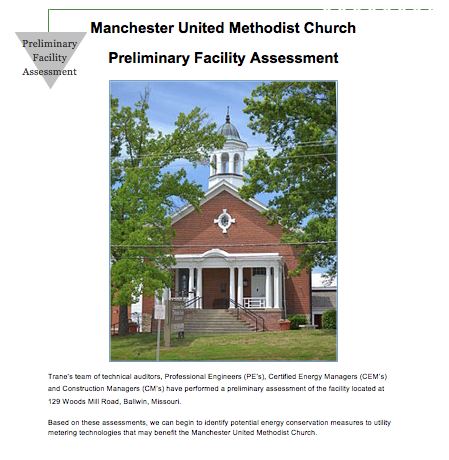 A small group of church members formed an energy LLC to finance the PV project. This group provided the capital for the project, and in return received the tax credits and depreciation the church could not claim as a religious institution. In addition, the church agreed to buy the solar energy produced from the LLC until all the investment was paid back. At this time the LLC will donate the PV system to the church, so the church will get the system at essentially no cost. Concurrently with the PV project, another small group of parishioners, guided by a local electrician who donated his time, funded and installed a level-1 and 6.6Kw Level-2 EV charging station to share the PV energy with the community at no cost to them, and to inspire them to use electric vehicles. For the PV project construction, in addition to the LLC formation, brave parishioners strapped on safety harnesses and scampered across the church roof, installing hundreds of feet of mounting brackets and assisting with the wiring and inverter installation. Some helped prepare the panels on the ground or handed them up to carriers on a lift. Others provided food and drink. It was truly a community effort. In less than 6 months they had gone from panel program inception to a functioning system. Based on a solar analysis of the roof, and the capacity of the system, they estimate that their PV system will generate 21,700 KwH per year, which @ 14¢/KwH will give them $3,000 in annual savings and will decrease their carbon footprint by 15.5 metric tons CO2 /year. The 30-tube, 120-gallon water-heating system has saved an additional 3 metric tons of CO2 per year. For the EV car charging system, assuming an average of 1 hr of charging / day @ 6.6Kw/hour, they estimate that they would provide 2,400 KwH / year which would represent 1.7 metric tons CO2 / year of car exhaust avoided by using solar power. These projects along with LED lighting, high-efficiency gas boilers, modern, programmable thermostats, and solar powered parking lot lights will make a marked difference in their carbon footprint. Many members of their church have invested in solar power for their homes or purchased electric vehicles. One of the members of the congregation was so inspired, he worked with their provider and other parishioners on a 24-panel DIY PV project at his home in West Cumberland. In addition, they’ve met with a local business owner, a representative of a town planning committee about PV for the new fire station, and other local churches to discuss how they approached their PV project. Sisters of St. Joseph feel a sense of responsibility to the land in their care. They pulled from the religious and ethical beliefs to create a plan for the future of the land they owned. In 2015 the Sisters of St. Joseph affirmed a Land Ethic Statement to guide their future decisions about their Brentwood property. It is based in their awareness of the responsibility we all have for the health of Earth and in particular for the Long Island Bioregion. In response to that statement, members of the congregation have formed new partnerships on Long Island, gathered information about the bioregion, implemented new initiatives, and continued ecological projects that were already in place. 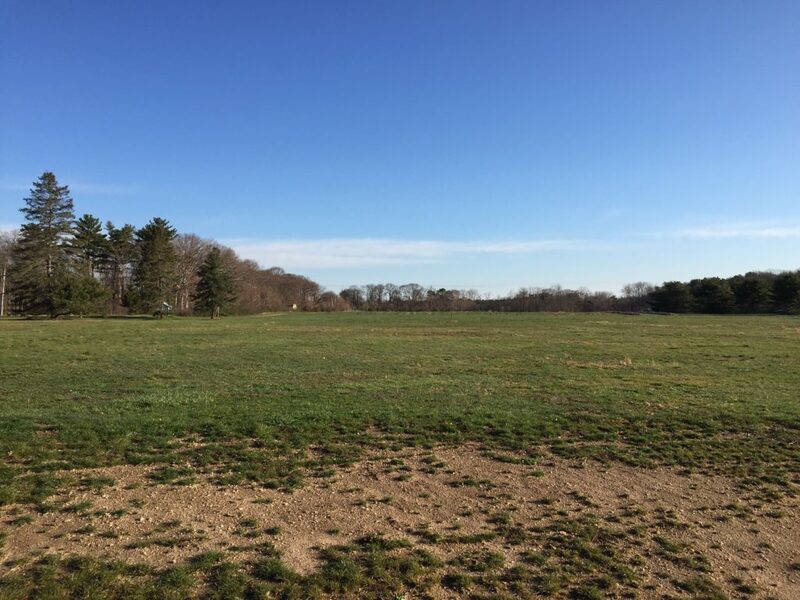 For the past two years they have been working with the Peconic Land Trust to preserve the land and to return it to agriculture. They have leased parcels of land to three farmers, and the fields that once were a working farm are slowly being restored to agriculture. The vegetables grown there will be totally organic and next year they should be available at farm stands for purchase by the local community. At the same time they are experiencing change in membership and financial resources many Religious congregations have come to feel a growing responsibility to initiate a new relationship with their lands. Land protection groups are realizing that the sacred lands of religious congregations constitute an outstanding collection of unprotected natural areas and open spaces. The Sisters of St. Josheph’s Brentwood property is a 211-acre parcel that contains significant natural and community resources. Land trusts are in a unique position to help faith-based organizations understand their options regarding the lands that have been integral to their mission and ministry. The Sisters of St. Joseph chose to collaborate with Peconic Land Trust as they endeavor to protect the land that they hold in sacred trust. The Peconic Land Trust staff conducted an analysis of the land based on the soils, vegetation, built structures, and historical land uses. As they evaluated the special features of the property they strategized about what conservation tools could be utilized to protect the unique features of the property in the context of their Land Ethic Statement. The long-term recommendations being considered include possible conservation easement options and suggestions for land management that concentrate on the shared sense of mission, obligation, sacrifice, and perpetual care for the land. They have given themselves and their resources to the challenge. 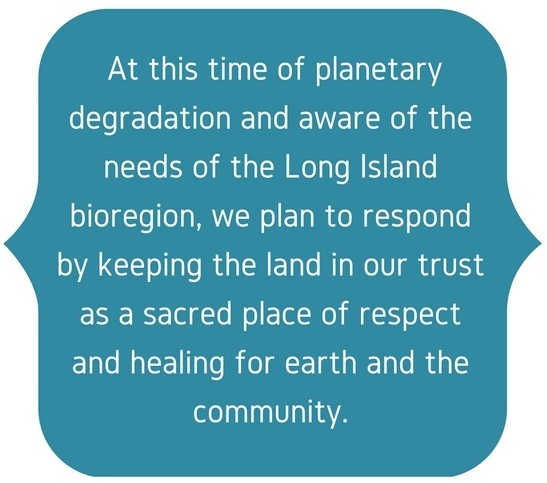 At this time of planetary degradation and aware of the needs of the Long Island bioregion, they plan to respond by keeping the land in their trust as a sacred place of respect and healing for earth and the community. Sometimes bringing in someone to do an audit of the facilities can create many opportunities to cut your carbon footprint and save money. This is what happened at Manchester United Methodist Church (MUMC). 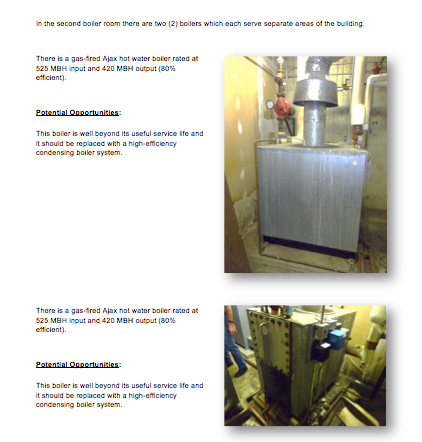 The opportunities to minimize the environmental impact and carbon footprint were large by installing newer high efficiency equipment, converting constant volume systems to variable air volume systems, upgrade to high efficiency condensing boilers, re-designing the chiller plant for thermal ice storage, and installing a building automation system to control the building to operate only when necessary. 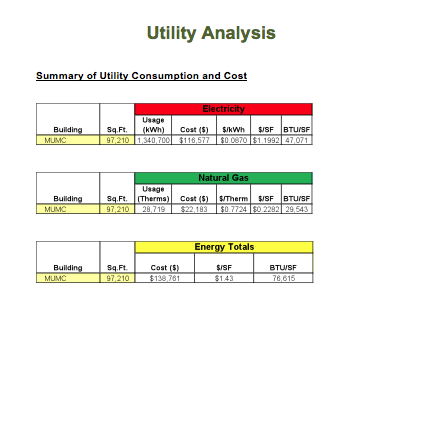 The energy savings impact in this preliminary feasibility analysis was an estimated reduction of 30-35% in electric and heating fuel consumption from the conservation measures analyzed.